The new ECH pressurized cartridge containing a sequence of innovative systems, such as: FPS, EC and LC. These systems are the result of an extensive research and development by our R&D Department in collaboration with the best Teams taking part at the SBK World Championship and also at the British and Italian Championship. All the information about these systems can be found in the following pages. TARGET: To offer the rider the highest stability to the front end, thanks to its perfect control of deceleration even under the hardest braking; it increases the grip entering and exiting a curve thanks to its immediate hydraulic control; a more uniform tire wear thanks to its instant control of applied force. All this gives the rider the best control under braking, even at extreme angles, and the best curves on any kind of tracks. Pumping rods with Ø10mm with surface coating against friction. CrSi steel springs, with heat treatment, stabilising procedure and final shot-basting with steel balls. On the top cap there are all adjustments: the spring preload is for the first time supplied with hydraulic actuation, while rebound and compression are separated on the two cartridges in a simpler and more convenient way. EC Easy Changer: this is a quick change system: fast replacement of the spring, already available in the previous YCE cartridge version, with a free key and a new exclusive cartridge dismantling system, which does not require the fork removal. This system makes the set-up bike modification easier by racing technicians. LC Light Components: this product is manufactured with a high percentage of special light alloys, thus decreasing the weight of the previous YCE considerably. FPS®, Full Pressure System represents the highest efficiency and practicality of this patented system. This innovative damping system is created for immediate fork oscillation control, thus avoiding any cavitations of the internal fluid. This system is low pressure gas pressurized. The cartridges are asymmetric: where one controls the compression, the other one controls the rebound. With two alternate chambers at the two ends, it is possible to reach a very high damping coefficient even at very low speed. The package is supplied with Olio Synt FUCHS SILKOLENE offering rich sliding, for the external lubrication, granting a perfect consistency and performance. It is available for the most popular 600-1000cc bikes on the market. 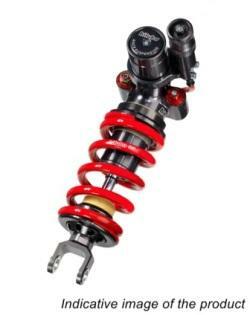 EVOLUTION of this shock has culminated in an overall weight decrease, using an aluminium body, which has always been a very important feature in racing for better handling response to the rider’s needs. 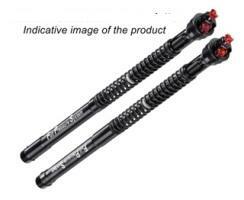 In addition to new set-ups, even more race-ready, and a upgrade aimed at better performance and adjusting simplicity of the length and hydraulic spring preload adjustment. INNOVATION is in the internals of the shock, with new technical solutions for improving the damping coefficient and increasing the stability at high temperature. The Ø14mm rod improves the sliding, while the Ø30mm piston reduces the moving fluid masses. These improvements have produced a reduction of inertial forces, and therefore an immediate control of the suspension oscillations.